Punjab2000 presents to you Manpreet Singh also known as ‘The Comic Singh’. He is a very talented comedian that specialises in stand up comedy. He was born in Amritsar, Punjab. 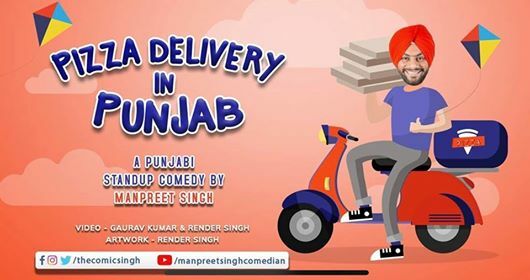 Manpreet Singh’s comedy videos have taken off on youtube. Each of his video’s have received over 100,00 + views, which is an amazing achievement. We believe comedy is a tough industry to be in due to the fact comedians have to constantly come up with original material that will make the whole audience laugh. Manpreet Singh prides himself in his clean comedy content as he wants to keep it very witty and clever. He uses his day to day life style, the punjabi culture and the people around him to come up with ideas for his comedy stories. He has recently uploaded a pizza delivery in Punjab video which we found to be very fun.